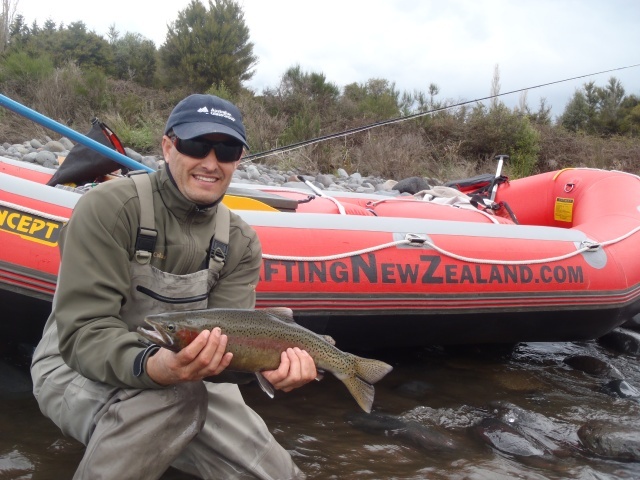 The weather does’nt really know what it wants to do this past week which has given anglers some interesting conditions to deal with.There is plenty of fish in the Tongariro with no fisherman so those who can fish between weather spells have done extremely well. There is a real mixed bag of fish in the river right now with good numbers of small fresh fishÂ and quite a few recovering troutÂ which are showing up in most town pools. 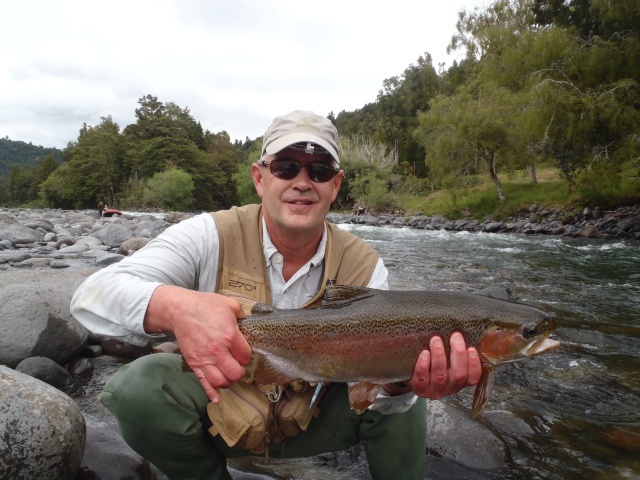 Again I have been lucky with my guiding and have spent four days out on the river with Joe Twegg from AustraliaÂ and Lyn and Garry from USA which all have enjoyed good fishing. I certainly have had some up’s and downs with these guys from sheer delight of Joe introducingÂ me to a new flyÂ pattern which slayed them, Lyn and Garry performing double hook up’s and then my part in it all locking my keys in the car on the river half way through the day!!!!. I have been guilty of this in the past but somehow have managed to do it again despite having a beeper type locking system on the new truckÂ which technally means you cant lock your keys in but I assure you itÂ is possible. The braids have again been a good place to get a few fish early in the morning especially with the slightly higher conditions but the afternoons have been productive in the upper river while targetting the shallower riffles with the dry and dropper combo. Ok, these fish we have looked for in this water are generally not that great condition wise but still great fun for clients justÂ wishing to hook fish up!Â Â While looking for these fish in the upper river we have been using a Blue Humpy dry fly and a simple nymph pattern such as a Quasimodo, PTÂ variant or Hare and Copper. There are so many fish in the river at the moment we actually caught fish in every area we have fished. This could mean that the river has good numbers of fish or there are just no anglers about at the moment, I have a feeling itÂ is both of these reasons. 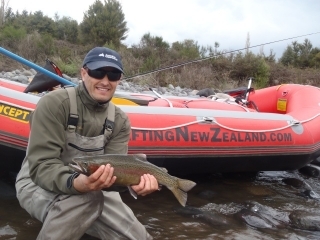 This time of year offers the fly fisherman endless opportunities with so much water available and different methods which will be productive.Â Next month the upper Tongariro will again open for anglers which will see some keen fisherman exploring some of the best water in taupo from the raft. 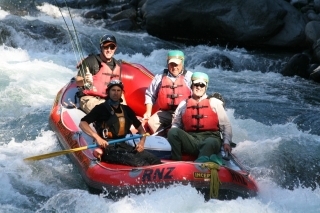 The raft really is a vital tool to see and enjoy this pristine untouched water which is always a hit with the punters. Fisherman can expect to polaroid big numbers of trout in the gin clear water and usually will finish the day with big numbers under their belts. There will be a real mixed bag of trout in these upper reaches from recovering trout which will be heading down river to the fresh late spawner which will be arriving all December and leading into January. This late season gives anglers good numbers of trout to target right into the end of January and will be a regular day out for me this summer. 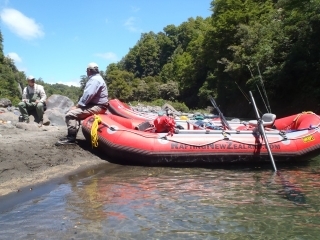 Lucky for someone I am looking for a fishermanÂ which would like to do the tripÂ and man up with another fantastic client and share the trip raft fishing the headwaters of the Tongariro sometime in December. The client I have got is flexible with dates and is a very experienced fisherman with a great sence of humour so a great day will be had. I am looking at getting this date in the diary asap so fist in first served. Drop me an email and I can explain the details to see if it will suit!! Dont let this chance get away as they dont come along to often, it will be a real eye opener if you have not seen the upper river yet. Looks like we have mixed weather over the next few days so will be expecting the river to be quiet again which should be encouraging for anglers to make the trip and soak up the last of the fresh fish pushing through. IÂ will be in the back-country this week so I am praying for the showery rain to stop and give me some low water levels to play in.